We’ve seen the films where the guys have permanently stocked beer fridges and pool tables in huge outhouses, and although you may not have the space to accommodate those kind of luxuries, you deserve a mancave. Whether it’s a box room, converted attic, basement, garage or shed, find a space and get to work. The first thing to think about is electricity, you’re going to need power for your iPod dock, console, mini fridge and TV. If you don’t currently have power in your future sanctuary, try running an extension cable until a more permanent solution can be found. If space is an issue you’re going to want smaller seating, shelves to save space, and perhaps a wall mounted TV. Before you make any big purchases put a Facebook status out to see if anyone is getting rid of anything you might want, you’ll be surprised at what you find. Another great tool for kitting out a mancave is the Gumtree freebie page. If your mancave is within the home you might want to think about soundproofing, It’s no good having your own space if you can’t play music into the early hours or stay up all night on watching films. To find out how to soundproof a room on a budget, check out Oakwood Doors guide here. 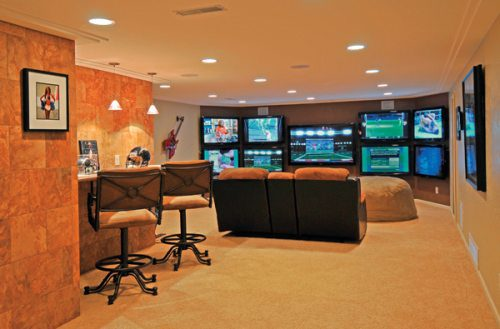 If your mancave is outside of the house, insulation is going to be vital. Try cladding any shed walls and blocking any entering drafts. You’ll also need to make sure the space is completely waterproof, especially if you’re going to have electricity going out to it. If it’s going to be an outdoor mancave, make sure you purchase a heater so you can still use it during the colder months. Unless you want to disconnect from the world for a while, you might also need to think about moving the router. If your new found man space is outside the home you’re probably going to have to get the router as close to the nearest door as possible. You may be able to boost your signal with a new router if needed. Decoration is essential. You may not need to actually get a tin of paint out, but some old memorabilia, posters or sports shirts won’t go a miss. Check the attic or storage for bits and pieces you may have forgotten about, or go on a charity shop search. Old record covers can look great when they’re framed on walls.